Law enforcement officials are seen in San Bernardino, where a man was reported to be holding a gun to his head on Thursday, Dec.14, 2017. 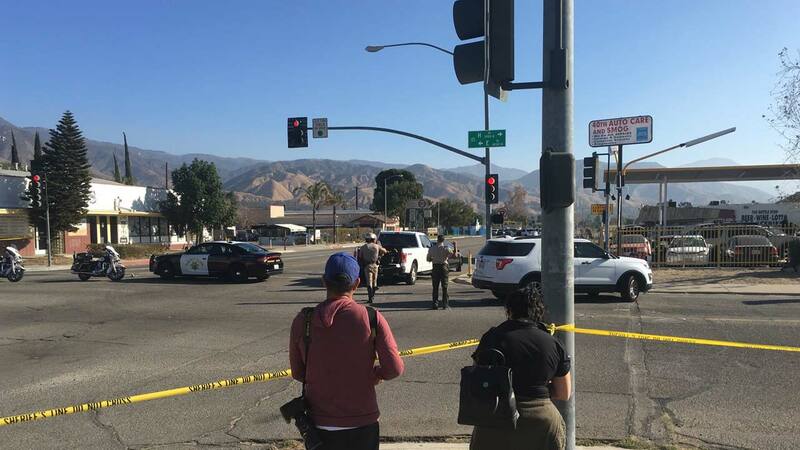 SAN BERNARDINO, Calif. (KABC) -- A man who held a gun to his head in San Bernardino, prompting a large law enforcement response and the lockdown of an area day care, has surrendered, officials say. The incident started with a probation check near 40th and E streets in unincorporated San Bernardino Thursday morning. The situation turned into a short foot pursuit, San Bernardino County Sheriff's officials said. Deputies set up a perimeter in the area, and negotiators arrived on scene. Investigators said the man was holding a gun to his head. No other details were immediately available. A nearby day care/learning center was placed on lockdown. Witnesses said there were approximately 30 children inside the facility. Sheriff's officials later tweeted the suspect surrendered and has been taken into custody. Officials confirmed no schools or students were impacted by the incident.